VANCOUVER, BRITISH COLUMBIA—(Marketwired – Dec 3, 2014) – Brian Arkell, CEO and President of Caza Gold Corp. (TSX VENTURE:CZY)(FRANKFURT:CZ6), is pleased to announce that the Company has engaged Aeroquest International, Ltd. to conduct an airborne magnetics survey over its Los Andes High Sulfidation Project. The survey will cover some 550 line kilometers over the central portion of the Los Andes project where previous exploration has identified high sulfidation type alteration and Au–Ag mineralization. The survey and final data analysis are expected to be completed in first quarter 2015. Caza recently completed additional trenching and drillhole assays on the San Francisco Project, located at the southern end of the Los Andes trend. Mineralization at San Francisco is associated with quartz– carbonate veins hosted in argillized felsic volcanic and dacite intrusive rocks. The alteration footprint in San Francisco comprises some 3 square kilometers. All three diamond drill holes intersected significant thicknesses of low sulfidation quartz–carbonate veins along with highly anomalous gold values. The veins were up to 6.3 meters in width (downhole). True width cannot be determined from the information available at this time. “It is evident from the high percentage of calcite in the veins that we are dealing with the upper levels of a high sulfidation vein system that needs further exploration and drilling,” adds Brian Arkell. Additional exploration plans at San Francisco include the airborne survey, detailed mapping, as well as further trenching and drilling. Caza Gold has a quality control and quality assurance program in place for the San Francisco Project. Core samples are collected under the supervision of Company personnel and transported to a secure storage area. Company geologists measure recovery, log the core by standard geologic methods, photograph the core in the boxes, and supervise the cutting of the core using diamond saws. One half of the core is sent for assay and the other half retained for further study and inspections. Coarse, blind, blanks and blind commercial standard gold reference materials for analysis control are inserted in the sample stream. Half–core samples in sealed bags are trucked to the primary laboratory. Blanks and standard reference material results are within acceptable ranges. All samples were prepared at the Inspectorate prep facility in Managua, Nicaragua and analyzed at their Reno, Nevada analytical labs. Brian Arkell, MSc. Geology, Fellow AusIMM, President and CEO, is the Qualified Person who reviewed and approved the contents of this news release. The Company also announces its board of directors has resolved to redeem all of the Rights issued and outstanding under the Company's Shareholder Rights Plan (the “Plan“) and otherwise effectively abandon the Plan. Under the Plan, one Right has been issued and is attached to each issued and outstanding common share. The Plan provides that the Board may elect to redeem all, but not less than all, of the Rights at a redemption price of $0.0003 per Right (the “Redemption Price”) and/or terminate the Plan. The Company will have no obligation to make any payment to any person in the event the aggregate amount owing to such person as a result of the redemption of Rights is less than $15.00 (ownership of less than 50,000 shares). Computershare Investor Services Inc. is the Company's Rights Agent under the Plan. The effective date of the redemption was the close of business on December 2, 2014 (the “Redemption Date”) as of which date the only right of qualifying holders of Rights is to receive the Redemption Price. This decision to abandon the Plan was taken by the Board following careful consideration of the relevance and utility of the Plan in relation to the current circumstances of the Company. As a result of the redemption of the Rights, the Plan is terminated. Registered Shareholders who qualify and wish to receive their nominal payment of $0.0003 per right must complete the Request for Redemption Form which is available by either contacting the Company directly (Philip@cazagold.com or by calling (604) 685–9750) or by downloading the form from the website of the Company at www.cazagold.com under the 'Investor' heading. Beneficial shareholders that qualify must contact their brokerage firm to have them complete the required request. Request for Redemption forms must be received by the Company on or before December 31, 2014. The redemption price payable to any holder of rights will be rounded up or down, as applicable, to the nearest cent. Caza Gold Corp. is a Greenfields exploration company focused on discovering new gold deposits in Nicaragua. The Company controls a large land position in the highly prospective but largely undeveloped gold belts of Nicaragua. Caza Gold has developed a large portfolio of projects in Nicaragua, including the Los Andes gold–silver project and the Piedra Iman copper–gold project. This news release includes certain statements and information that may contain forward–looking information within the meaning of applicable Canadian securities laws or forward–looking statements within the meaning of the United States Private Securities Litigation Reform Act of 1995. All statements in this news release, other than statements of historical facts, including statements regarding future estimates, plans, objectives, assumptions or expectations of future performance, the likelihood of commercial mining and financing requirements and the ability to fund future exploration and development are forward–looking statements and contain forward–looking information. Generally, forward–looking information can be identified by the use of forward–looking terminology such as “intends” or “anticipates”, or variations of such words and phrases or statements that certain actions, events or results “may”, “could”, “should”, “would” or “occur”. Forward–looking statements are based on the opinions and estimates of management as of the date such statements are made and they are subject to known and unknown risks, uncertainties and other factors that may cause the actual results, level of activity, performance or achievements of the Company to be materially different from those expressed or implied by such forward–looking statements or forward–looking information. Although management of the Company has attempted to identify important factors that could cause actual results to differ materially from those contained in forward–looking statements or forward–looking information, there may be other factors that cause results not to be as anticipated, estimated or intended. There can be no assurance that such statements will prove to be accurate, as actual results and future events could differ materially from those anticipated in such statements. Accordingly, readers should not place undue reliance on forward–looking statements and forward–looking information. The Company does not undertake to update any forward–looking statements or forward–looking information that are incorporated by reference herein, except in accordance with applicable securities laws. We seek safe harbour. Hotel's Warm Hospitality Makes the Holidays Brighter in Georgetown, D.C.
WASHINGTON, DC—(Marketwired – Dec 3, 2014) – As the capital of the country, it stands to reason that Washington, D.C. is also the capital of holiday fun. From the National Christmas Tree at the White House, to ZooLights at the National Zoo, The District celebrates the season in a big way. And for those who want to experience all the action from an urban sanctuary, the Washington Marriott Georgetown offers the perfect blend of revelry and retreat. Located among hotels near M Street in Washington, D.C., this property is just minutes from Georgetown. As a result, visitors can easily access some of the area's best shopping for holiday gifts. Many of Georgetown's most beloved boutiques, from Fornash's prep–inspired finds, to Sangaree's designer duds, are located along M Street. Other hotspots are close by, too, like M29 Lifestyle, which sells style–savvy apparel for the whole family, and The French Apartment, where shoppers can score sophisticated home goods. Those in town between December 12 and 14 shouldn't miss Georgetown GLOW, a public–art festival that features local, regional and international artists' work. The event is also a prime opportunity to try the acclaimed dining in Georgetown, D.C. where more than 140 restaurants and gourmet stores represent upwards of 50 ethnicities. And guests who are in the mood for American fare done exceptionally well don't even have to leave the property: The Atrium Restaurant serves up classic American dishes unrivaled by anything beyond the hotel's front doors. Of course, sometimes the holidays call for nothing more than getting outside and making the most of the brisk weather. To that end, this Washington, D.C. hotel near Georgetown University is just minutes away from Rock Creek Park and the Washington Harbour Ice Rink. With 11,800 square feet of ice, this rink outsizes even NYC's Rockefeller Center rink. As one of the most convenient hotels in Georgetown, D.C., the Washington Marriott Georgetown lets guests easily experience any attraction they choose. Its central location between the trendy Dupont Circle and picturesque Georgetown put the city's best destinations within reach, yet the hotel's tree–lined street and quiet refinement give the sense of a secluded retreat. 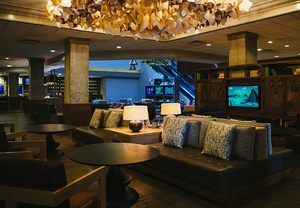 Inside, a renovated lobby and lounge speak to modern travelers with tech–friendly features and inviting, flexible seating, while features like the indoor pool, casual restaurants and fitness center make staying in just as pleasant as going out and joining the holiday party. The Washington Marriott Georgetown makes a distinctive destination among Washington, D.C. properties. Its enviable address near national monuments, renowned universities and family–friendly attractions appeals to leisure and business travelers alike. On property, guests enjoy inspired dining at both The Atrium Restaurant and The Court Lounge, as well as access to a fitness center, indoor pool and whirlpool. Business guests stay productive with the hotel's 12,000 square feet of versatile function space (including a 600–person ballroom), as well as with the 470 guest rooms' adaptable work desks and Plug–in technology panels. Other guest room features, like the 32–inch HDTVs and down comforters, promise a relaxing escape into the nation's vibrant capital city. To see additional photos of the hotel, follow Washington Marriott Georgetown on Facebook, Twitter, and Instagram. SOUTH SAN FRANCISCO, CA—(Marketwired – Dec 3, 2014) – Theravance Biopharma, Inc. (NASDAQ: TBPH) (“Theravance Biopharma” or the “Company”) announced today, through its U.S. operating subsidiary, Theravance Biopharma US, Inc., that stock options to purchase an aggregate of 104,800 of the Company's ordinary shares were granted to ten new non–executive officer employees on December 1, 2014. The options were granted in accordance with NASDAQ Listing Rule 5635(c)(4) under the Theravance Biopharma, Inc. 2014 New Employee Equity Incentive Plan (the “Inducement Plan”), which the Board of Directors of Theravance Biopharma adopted in October 2014 to facilitate the granting of equity awards to new employees. Each option has an exercise price per share equal to $14.90, which was the closing price of one Theravance Biopharma ordinary share on the Nasdaq Global Market on the date of grant. The options vest over four years, with 25% of the option shares vesting on the first anniversary of the date of grant and the remaining 75% of the option shares vesting in monthly installments over the three years thereafter. The options have a ten year term, and are subject to the terms and conditions of the Inducement Plan and applicable stock option agreement. Theravance Biopharma has one approved product, VIBATIV® (telavancin), which was discovered and developed internally, a pipeline of internally discovered product candidates and strategic collaborations with pharmaceutical companies. In addition, the Company has an economic interest in future payments that may be made by GlaxoSmithKline plc (GSK) pursuant to its agreements with Theravance, Inc. relating to certain drug programs, including the combination of fluticasone furoate (FF), umeclidinium (UMEC), and vilanterol (VI) (FF/UMEC/VI), the combination of the bifunctional muscarinic antagonist–beta2 agonist (MABA) GSK961081 ('081) and FF ('081/FF), and MABA monotherapy. By leveraging its proprietary insight of multivalency to drug discovery, the Company is pursuing a best–in–class strategy designed to discover superior medicines in areas of significant unmet medical need. Theravance Biopharma is a publicly–held corporation, with U.S. headquarters located in South San Francisco, California, and trades on the NASDAQ Global Select Market under the symbol TBPH. For additional information, please visit www.theravance.com. SEATTLE, WA—(Marketwired – Dec 3, 2014) – Syntegrity, the provider of integrated security strategies and solutions for enterprises in the Global 2000, today announced its inclusion on the INC. 5000 list as the 12th fastest growing security company in North America. Syntegrity grew 605% over the three–year period used to determine the 2014 INC. 5000 standing. Syntegrity's dramatic growth has been achieved through a singular focus on uniting Enterprise Data Security and Identity and Access Management platforms into a cohesive intelligent security system. A comprehensive software offering combined with complete wrap–around consulting, implementation and management services gives Syntegrity the agility to respond to any business requirement, even where existing solutions are in place. Syntegrity's InstantIAM platform provides adaptive authorization, device recognition and validation, integrated data security and out–of–the–box identity management workflows for user management, authentication and authorization. These capabilities can be layered on top of existing IAM deployments, or delivered with additional best–of–breed software to plug any gaps in the existing system. Built with Cloud Scale, DevOPS and Big Data in mind, InstantIAM leverages open source technologies, allowing customers to rapidly support internal and external user bases scaling up into the hundreds of millions of users. Syntegrity will be presenting more information about InstantIAM at the Interface Conference on December 4th in Seattle. LAS VEGAS, NV—(Marketwired – Dec 3, 2014) – Newforma, a project information management (PIM) software company transforming building and infrastructure project delivery, today announced it has partnered with NRI, the New York–based leader in digital, print and technology equipment solutions to the AEC industry, to promote construction team collaboration through the viewing and interactive mark–up of full–size plans on large, interactive screens. Newforma's SmartUse app works on Windows 8 operating systems, which support large, touch–enabled screens such as those distributed by NRI. Users of the SmartUse app will improve collaboration by having NRI install interactive screens large enough to facilitate real–time team problem solving. The SmartUse app operates on Microsoft Surface tablets, Windows 7 and 8 computers, Apple iPads and large screens operated using the Windows 8 OS. The SmartUse app may be downloaded as a free viewer for unlimited users or as a fully functional limited–time free trial. The SmartUse app provides construction and operations teams with a simple way to review, annotate, compare, and share the most recent drawings and specifications. The app automates processes, reduces meeting times, and improves team members' understanding of project requirements. More about the technology and features of the SmartUse collaboration app may be seen at www.smartuse.com. Newforma develops SmartUse and other project information management (PIM) software for design, construction, and operations. Newforma products make up the first industry–focused and integrated solution to connect firms to each other, to their project information, to their processes, and to remote team members, all for the purpose of more successful project delivery. For more information about Newforma, visit www.newforma.com, or phone +1 603–625–6212. © 2014 Newforma, Inc. Newforma is a registered trademark of Newforma, Inc., in the United States and in other countries. SmartUse is a trademark of Newforma Canada ULC. NRI is a trademark of National Reprographics Inc. All other brands or products are trademarks or registered trademarks of their respective holders and should be treated as such. BELLINGHAM, WA—(Marketwired – Dec 3, 2014) – Biomedical devices that detect and pinpoint cancer cells with more accuracy, additive systems to enable 3D manufacture at the micro–nanoscale, and sensors that improve highway safety by analyzing road conditions are among finalists for the 2015 Prism Awards for Photonics Innovation. The awards are sponsored by SPIE, the international society for optics and photonics, and Photonics Media. Winners will be announced by industry leaders on 11 February during SPIE Photonics West in San Francisco at a gala banquet that has become one of the largest gatherings of photonics VIPs. Among past presenters are Amazon vice president Babak Parviz, one of the inventors of Google Glass; Mary Lou Jepson, head of the Display Division at Google X, founder/former CEO of Pixel Qi, and co–founder/CTO of One Laptop per Child; and Michael Mertin, President/CEO of Jenoptik AG and President of the Photonics21 Executive Board. 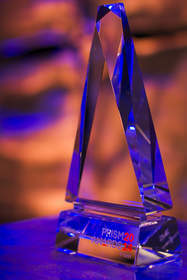 Entries are judged by an independent panel including industry executives, leading academic researchers, venture capitalists, and past Prism Award winners. Additive Manufacturing: FEMTOprint, LUXeXcel, and Multiphoton Optics. Biomedical Instrumentation: BacterioScan, Clearbridge Biophotonics, and TomoWave Laboratories. Detectors and Sensors: Hamamatsu, Lufft, and OndaVia. Imaging and Cameras: Advanced Scientific Concepts, ESPROS Photonics, and Seek Thermal and Raytheon. Industrial Lasers: Cobolt, IPG Photonics, and JDSU. Materials and Coatings: ALPhANOV, Element Six Technologies, and Inrad Optics. Optics and Optical Components: Corning, US Conec, and Intel; Varioptic, a Business Unit of Parrot; and Vescent Photonics. Other Metrology Instrumentation: Mahr, Polytec, and WITec. Scientific Lasers: Fianium, Northrop Grumman – Cutting Edge Optronics, and Optonicus. SPIE is the international society for optics and photonics, a not–for–profit organization founded in 1955 to advance light–based technologies. www.spie.org. Photonics Media, a business unit of Pittsfield, Mass.–based Laurin Publishing Co. Inc., publishes Photonics Spectra, BioPhotonics, EuroPhotonics, Photonics Buyers' Guide and Photonics.com. www.photonics.com. 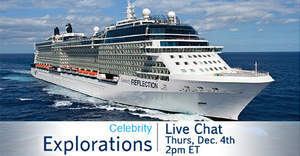 NEW YORK, NY—(Marketwired – Dec 3, 2014) – Luxury Cruise News and Celebrity Cruises are hosting a live online event for consumers on Celebrity's newest vacation packages, taking place on Thursday, December 4 at 2pm EST. LCN Cruise Chat will bring travelers together with Celebrity experts to hear about an exciting new collection of Celebrity Explorations, which combine ocean and river cruise voyages into one amazing vacation. From beautiful riverbanks to stunning seas, Celebrity Explorations offer the best of both waterways, combining immersive Europe river cruises with breathtaking ocean sailings. The collection includes 11 unique vacation packages, featuring Amras Cruises river journeys on the Danube, Rhine, Rhône and Seine — paired with Celebrity's ocean sailings around the Mediterranean, Scandinavia, Russia, Turkey, and more. All Cruise Chat attendees will receive an exclusive specialty dining offer from Celebrity Cruises*, and be entered into a drawing to win a $500 gift card! The live web event will take place on Thursday, December 4th at 2pm EST. Sign up for LCN Cruise Chat here! Luxury Cruise News is the definitive resource for sophisticated cruise enthusiasts to research and plan their next perfect voyage. Whether it's an ocean, river, expedition, or yacht sailing, we are dedicated to bringing our readers the most unique and special offerings from the world of luxury cruising. Visit us at www.luxurycruisenews.com. Luxury Cruise News is the sister publication of Your Travel Insider and is part of the Consumer Travel Group at Northstar Travel Media LLC, a Wicks portfolio company. Celebrity Cruises' iconic “X” is the mark of modern luxury, with its cool, contemporary design and warm spaces; dining experiences where the design of the venues is as important as the cuisine; and the amazing service that only Celebrity can provide, all created to provide an unmatchable experience for vacationers' precious time. Celebrity Cruises' 11 ships offer modern luxury vacations visiting all seven continents and present immersive cruisetour experiences in Alaska and Canada. Celebrity is one of six cruise brands operated by global cruise vacation company Royal Caribbean Cruises Ltd. (NYSE: RCL) (OSE: RCL). For more information, dial 1–800–437–3111, visit www.celebritycruises.com, or call your travel agent. Terms and Conditions: Dining Credit Offer applies to new, individual 2015 Celebrity Exploration River Cruise Packages booked Dec. 4–31, 2014; veranda and higher staterooms; and up to two guests per stateroom. Offer includes two complimentary Specialty Dining Restaurant credits for use on the Celebrity cruise. One credit per dining reservation. One Offer per stateroom. Single occupancy guests eligible for one complimentary dining credit. Offer is combinable with 123go! offer. Offer subject to availability and change without notice. Credit is non–transferable, not redeemable for cash or refund of any kind and must be used. Ships registry: Malta and Ecuador. Redemption process: Once booking is confirmed and deposit is made, send an email with the booking information and the subject “Celebrity Explorations” to comments@luxurycruisenews.com. Once booking is verified, Celebrity Cruises will confirm the request for the complimentary dining and send out a confirmation. RANDOLPH, NJ—(Marketwired – Dec 3, 2014) – Consumer Goods Technology (CGT) is pleased to announce the formal appointment of Werner Graf to the role of CGT Industry Liaison, effective December 1st, 2014. In this newly created role, Graf will act as an ambassador between CGT and important industry associations and organizations, ensuring effective collaboration and synergies that will benefit both the CGT community and the industry as a whole. “I look forward to cultivating relationships across the multiple retail and manufacturing organizations that serve the consumer goods community. Stronger collaboration between these organizations has the potential to drive improved efficiencies, lower costs and higher living standards across the board. CGT can play a central role in driving this collaboration for the benefit of all, including the consumer,” said Graf. Graf is currently the General Manager and US Sales lead for Consumer Products clients for Tata Consultancy Services. He has more than 25 years of experience in the consumer products industry, including specific work in supply chain, demand chain, sales, client management and organizational design for companies such as Ernst & Young, IBM and Wipro. Graf began his career at The Procter & Gamble Company (P&G) in various manufacturing, distribution and customer service positions, eventually leading P&G's largest inbound distribution department: Dry Laundry. A graduate of the University of Notre Dame, Graf has a secondary teaching degree from St. Mary's College, and has participated in Tulane's MBA program, IBM's Harvard executive certification program, Wipro's Bangalore Leadership Program and TCS's Leadership Induction in Pune, India. He currently serves as Vice Chair of the Grocery Manufacturing Association's Associate Member Council and has been a longstanding member of CGT's Research Advisory Board. Consumer Goods Technology (CGT) sits at the intersection of business and technology in the global consumer goods community. As an integrated media brand, CGT helps more than 76,000 consumer goods industry influencers and decision makers across business and IT to improve business performance by delivering actionable insights, benchmark analysis and critical networking opportunities. Learn more about CGT at http://www.consumergoods.com. SAN FRANCISCO, CA—(Marketwired – Dec 3, 2014) – AppGyver (www.appgyver.com), provider of innovative tools for rapid mobile app development, today announced the launch of AppGyver Supersonic, a new hybrid mobile app Framework. Supersonic delivers hybrid app performance indistinguishable from native, easy integration of virtually any cloud service, and dramatically simplifies the creation of complex apps. The new framework builds on AppGyver's technology, which boosts PhoneGap–based HTML5 hybrid app performance to near–native app level. Supersonic introduces a new, declarative way for building high–performance mobile app user interfaces. By extending standard HTML5 syntax, Supersonic introduces a whole new set of native elements previously inaccessible to hybrid app developers. This seamless interplay of HTML5 and native UI blurs the line between the two, and reaches performance unseen in the hybrid app space until today. “Building HTML5 hybrid apps that look and perform like real native apps can be really hard. With Supersonic we're making it as easy as traditional web development,” says Marko Lehtimaki, CEO of AppGyver. With the Supersonic launch, AppGyver boosts Android performance by 2.5 to 3x as compared with traditional PhoneGap apps. AppGyver's technology is backward compatible with PhoneGap, bringing Android boost improvements to developers using any PhoneGap–based framework such as Ionic and Famo.us. Some of Supersonic's performance improvements are a result of AppGyver's collaboration with Intel on the open source web runtime project, Crosswalk. “Application developers can use Supersonic to create hybrid apps with native–like performance on Android. Developers building hybrid applications faster, with better performance gives end–users more choices and a better experience,” said Hillarie Prestopine, Director Software Experience Center, Intel's Open Source Technology Center. AppGyver provides a complete platform for novice and seasoned mobile developers alike to quickly build, test, preview and deploy fully functioning HTML5 mobile apps that are indistinguishable from native counterparts. AppGyver Supersonic, a next–generation mobile hybrid framework, pushes the limits of HTML5 and blurs the line between native apps and HTML5–based hybrids with a new high–performance mobile engine. For more information, please visit www.appgyver.com. DELRAY BEACH, FL—(Marketwired – Dec 3, 2014) – InterCore, Inc. (OTC PINK: ICOR) (“InterCore”) announces its DADS™ (Driver Alertness Detection System™) offer for personal users. DADS is a cloud–based service developed by InterCore's wholly–owned subsidiary SRG International Inc. and is available in three packages — Personal Users, Small Business and Large Enterprises. The personal package has a monthly monitoring subscription fee and a one–time set up fee which includes the DADS cloud membership, real–time monitoring driver alertness, real–time audible and visual warnings as driver alertness levels diminish and a DADS certified Bluetooth camera that interacts with the cloud services. This is now available for purchase at dads.srgint.com. Driving in a state of excessive fatigue or drowsiness is a key factor in one in five accidents involving death or injury. SRG's researchers have spent 12 years developing a technology to help drivers arrive home safely. The DADS service uses sophisticated technology to assess three stages of alertness in drivers. The system captures important information from users with an approved Bluetooth camera linked to a smartphone. When the DADS service detects reduced driver alertness that could lead to unsafe vehicle operation, it alerts the driver using audible and visual signals. These alerts are generated up to two hours before a driver's awareness is reduced to such a dangerous level that sleep could occur, giving ample of time to take preventive actions to prevent accidents and losses. InterCore, Inc., (OTC PINK: ICOR) is a public company focused on the commercialization and deployment of DADS™ and related products through its wholly–owned subsidiary SRG International, Inc. DADS utilizes proprietary alertness detection technologies and based on an algorithm that was developed in correlation with the electroencephalogram (EEG). See http://www.intercoreinc.com/ and www.srgint.com. This news release contains certain “forward–looking statements.” Forward–looking statements are based on current expectations and assumptions and are inherently subject to risks and uncertainties, some of which cannot be predicted or quantified, and many of which are beyond the Company's control. The forward–looking statements are also identified through the use of words “believe,” “enable,” “may,” “will,” “could,” “intends,” “estimate,” “anticipate,” “plan,” “predict,” “probable,” “potential,” “possible,” “should,” “continue,” and other words of similar meaning. Actual results could differ materially from these forward–looking statements as a result of a number of risk factors detailed in the Company's periodic reports filed with the U.S. Securities and Exchange Commission via the Edgar system. Given these risks and uncertainties, investors are cautioned not to place undue reliance on such forward–looking statements and no assurances can be given that such statements will be achieved.